Zafar Ishaq Ansari belongs to a family of scholars. His late father Maulana Zafar Ahmad Ansari was also a very famous and respectable scholar of Islamic Studies and was also elected to the National Assembly of Pakistan during the 1970s. Dr. Ansari obtained his M.A. and Ph.D. from the Institute of Islamic Studies, McGill University, Montreal, Canada in 1966. His main thesis for his PhD program was titled "The Early Development of Fiqh in Kufah with special reference to the works of Abu Yusuf and Shaybani". He studied at University of Karachi before going to Canada for his higher studies. Dr. Ansari has a flair for languages as well. While he is proficient and fluent in English, Urdu (his native language) and Arabic, he has a good command over Persian, French and German as well. Dr. Ansari started his teaching career as a visiting lecturer at Department of Oriental Studies, Princeton University, NJ, USA in 1966. Since then, he has been professor Islamic Studies and History at many reputable universities including King Abdulaziz University, Jeddah (1967–70), University of Petroleum and Minerals, Dhahran, Saudi Arabia (1970–86), University of Melbourne, Australia (1976 - visiting), McGill University Montreal, Canada (1976–1977), University of Chicago, Chicago (Summer 1979), Faculty of Shari'ah and Law, International Islamic University, Islamabad, Pakistan (1986–88) and Director General, Shariah Academy, International Islamic University (1987–1988). He was the Director General of the Islamic Research Institute, International Islamic University, Islamabad from (1988-2008); currently he is the Vice President of the International Islamic University, Islamabad. He is the editor of the quarterly journal Islamic Studies and is a member of the editorial board of Journal of Islamic Studies, American Journal of Islamic Social Sciences, Journal of Muslim Minority Affairs, Journal of Qur'anic Studies and Studies in Contemporary Islam. He is also a member of the international scientific committee appointed by UNESCO for the academic supervision of its 6-volume series on various aspects of Islamic Culture, and co-editor of its first volume, The Foundations of Islam. * Member, Editorial Committee, UNESCO sponsored 6-volume series on Various Aspects of Islamic Culture and editor of volume I entitled Foundations of Islam. * Member, Board of Editorial Advisers, American Journal of Islamic Social Sciences (1992--- ). * Fellow, North American Association for Middle East Studies, Tucson, Arizona, USA. * Consulting Editor, Journal of Islamic Studies (Oxford) (1993--- ). * Member, Editorial Advisory Board, Hamdard Islamicus (1991--- ). * Member, Editorial Advisory Board, Journal of Qur'anic Studies, (London: 1999 __). * Fellow, Association of Muslim Social Scientists, USA. * Member, Board of Advisers, Islamic Foundation, Leicester, U.K.
* Academic Adviser, International Institute of Islamic Thought in Pakistan (1987 ). * Member Joint Advisory Board, Centre for Islamic Studies, University of Wales, Lampeter, U.K. (1991–1994). * Editor, Islamic Studies, Islamabad (1989 --- ). * Member, Core Advisory Group, Bait al-Hikmah Research Centre, Madinat al-Hikmah, Karachi. * Member, Editorial Board, Intellectual Discourse, Journal of the International Islamic University, Malaysia (1993-). * Member Editorial Board, Journal: Institute of Muslim Minority Affairs (1995 ---). * Member, Editorial Advisory Board, Studies in Contemporary Islam (1999---). * Corresponding Member, Shibli Academy, Darul Musannifin, Azamgarh, India (1995--- ). * Member, Academic Advisory Board, Graduate School of Islamic and Social Sciences, Ashburn, Virginia, USA. * Member, Editorial Board, al-Tajdid, International Islamic University, Malaysia. * Member, Council of Islamic Ideology, Pakistan (February 1997-February 2000). * Chairman, Commission on Islamization of Education, Government of Pakistan (1998–2005). Shaykh Abu Shamsudin Ramzy ibn Mahmoud Ajem is of Tunisian descent and was born and raised in Toronto, Canada. In 1995, he left Canada to begin his Islamic studies in Damascus, Syria. He completed the two year pre-college program with honors at Abu-Nur Islamic Institute of Syria. While in Damascus, he had the honor to meet and study with a number of scholars including Sh. Ramadan al-Bouti, Sh. Muhammad al-Yaqoubi, Sh. Abd al-Rahman Kharsa, Sh. Nur al-din Ittir, Sh. Adib Kallas, Sh. Farid al-Jazairi, Sh. Abdul Mu`iz al-Nafti, Sh. Muhammad Kaylash, Sh. Mu’min Al-Annan, and Sh. Jihad Hashim Brown. In pursuit of the classical Islamic education, Shaykh Ramzy traveled to west Africa, where he was amongst the first westerners to be accepted by the Ministry of Religious Affairs and Endowments of Morocco to study at the Ancient Madrasah of Tanalat in the Atlas Mountains of Southern Morocco (Madrassat al-Hajj Muhammad al-Habib). As a full-time student at the school, he studied some of the known texts of the various Islamic sciences under its current director and teacher, Sidi Sheikh al-Haj Muhammad al-Ghali, who is one of the foremost students of its very founder: the famous Shaykh, al-Zahid, al-Wali, and Mujahid Sidi Muhammad al-Habib al-Susi (Allah have mercy on him). After completing basic texts in Grammar, Morphology, Aqida, and Fiqh, he received permission from his teacher Sidi Shaykh al-Haj Muhammad al-Ghali to teach in these fundamental fields of sacred knowledge. Since his return to Toronto, Canada in 2001, Shaykh Ramzy has been deeply involved in serving the Muslim community. He teaches regularly at Risalah Foundation and at Dar al-Marifa, a program that offers homeschooled children weekday classes in Arabic and Islamic studies. He currently resides in Toronto with his wife and children. 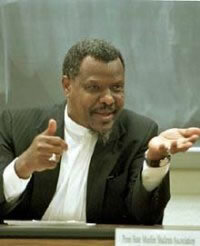 Shaykh Abdullah Idris Ali, an educator, thinker, scholar and past president of ISNA (from 1992-1997). He co-organized the Canadian Islamic Banking Conferences for 1996 and 1997. Sh. Ali serves as a member on the Board of Trustees for the Islamic Teaching Center (ITC) and North American Islamic Trust. He is currently the Director of Universal Foundation Inc., an organization that accredits Islamic schools in cooperation with National non public schools accreditation system.He is also a founding member of IBERR ( intl. board of educational research and resources ) along with Yusuf Islam. As principal of ISNA School (Toronto, Ont. Canada), Sh. Ali developed and implemented Islamic and Arabic Studies curricula for elementary and junior high students. He has written various articles in Islamic Horizons, is a member of the ATP Editorial Board, and also serves on the board of Islamic Dow Jones index. Abdalla Idris Ali is a native of the Sudan and currently resides in Kansas City, Missouri with his wife. He recently became a grandfather as his daughter gave birth to a beautiful daughter in April of 2008. He is the author of the Muslim Funeral Guide (Lamp Post Productions), The Attributes of God (Amalpress), and over 40 research papers and articles. He served as full-time Islamic chaplain for the State Correctional Institution of Chester, Pennsylvania for five years. Shaykh Zahir was raised in Toronto and completed a degree in Zoology with a minor in history at the University of Toronto. During his years on campus he was actively involved with the Muslim Student Association assisting in organizing many important events such as hosting the Mayor of Sarajevo during the tumultuous years of genocide against Muslims in Bosnia-Herzegovinia. Upon graduation In 1996 he left for Amman, Jordan to study Arabic. The following year he enrolled in the Arabic program at the University of Damascus and it is in Damascus that he would spend the next six years of uninterrupted study. In the years he spent in Damascus, Shaykh Zahir had the blessing of meeting and sitting in the company of some of the premier scholars of Damascus, learning Hanafi fiqh, aqida (science of beliefs), mantiq (logic), usul (critical intellectualism), hadith, and tafsir. Shaykh Zahir is a co-founder/director of the Lote Tree Foundation (an educational initiative). He is also the director of professional development at Razi Inc., a company he co-founded that develops specialized curriculum and professional programs to suit the needs of society.